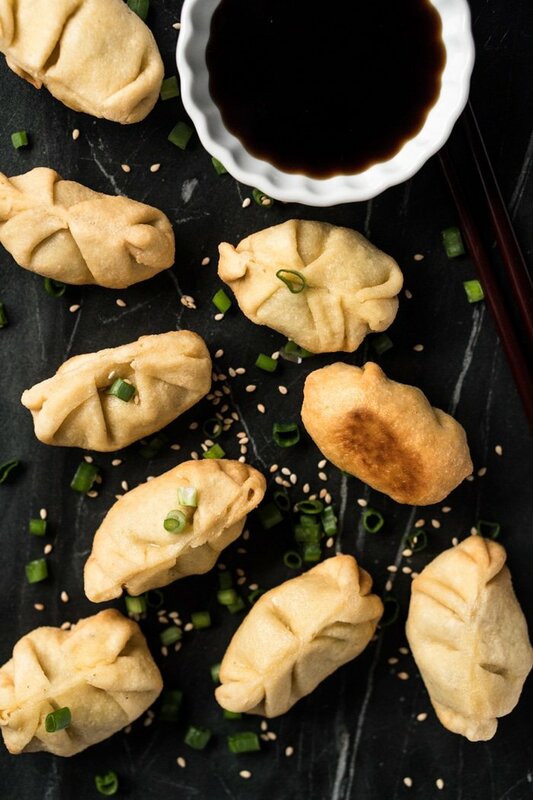 Missing dumplings, pot stickers and what-not?! 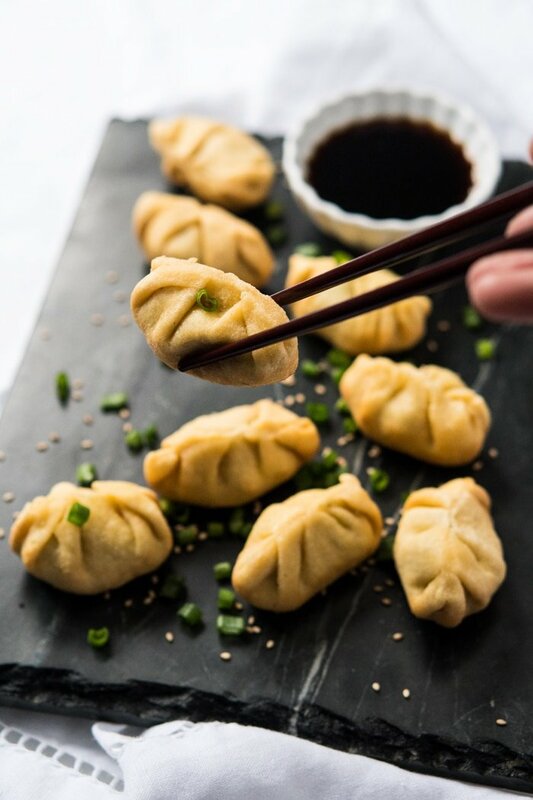 Count on these super tender and tasty gluten free and keto dumplings to satisfy the cravings! Because of the coconut flour, even though these low carb and keto dumpllings are lightly fried, they manage to stay light and tender. 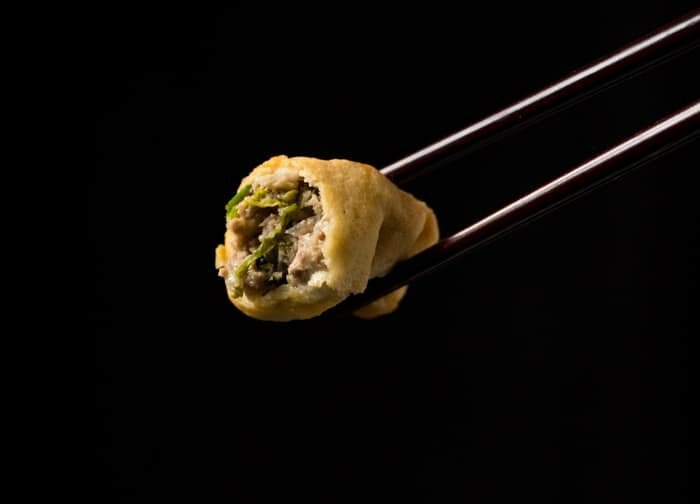 Think of them as a cross between pork dumplings and their dim sum relatives ham sui gok (glutinous rice dumplings). So while the wrapper deviates from the original, they will undoubtedly cure your cravings for Chinese takeout. Plus, while they do take a couple hours to put together, think of it as meal prepping supreme. 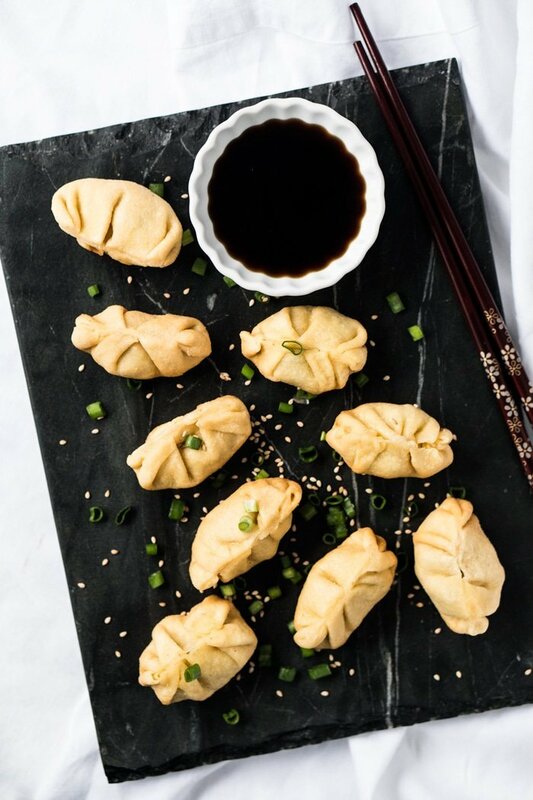 The dumplings can be cooked after briefly thawing them out, making them ideal for a quick weeknight meal. 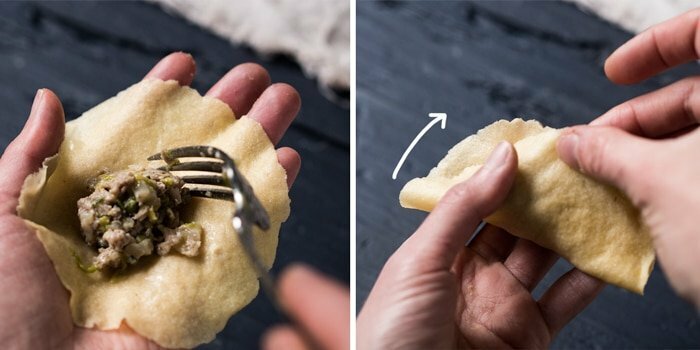 These keto dumplings are a spinoff of our grain free keto tortillas and ravioli. Think almost the same ingredients: almond flour, coconut flour and a touch of xanthan gum (minus the baking powder). But slightly wetter, so you’re able to get it nice and thin. 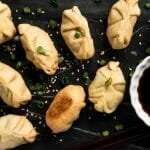 The filling for these low carb dumplings is a very simple, yet ridiculously tasty ground pork and Nappa cabbage infused with ginger and sesame oil. 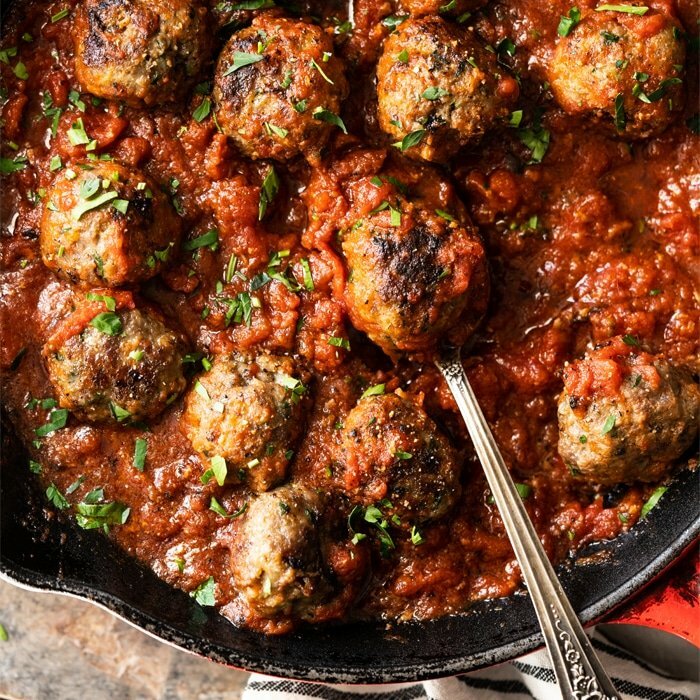 Having said that, other ground meats will work too (but we loooove pork here best!). 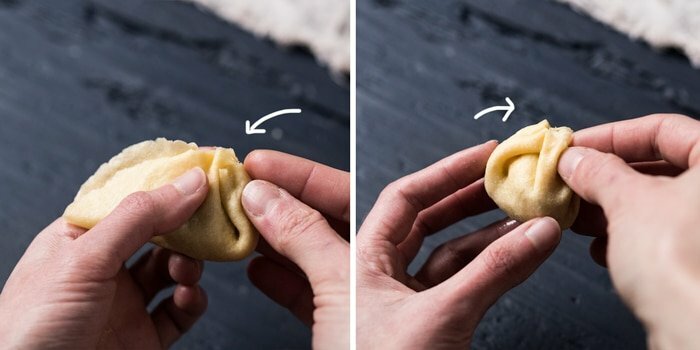 And given that our keto dough cannot be steamed or boiled, to keep the dumplings nice and tender we found it necessary to steam the filling prior to filling. This keeps it super juicy and very akin to tradition. But note that you can also fry it normally if you prefer. 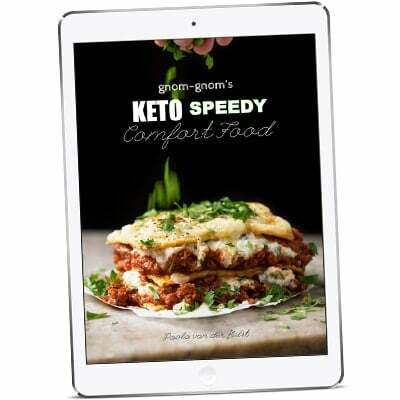 The real trick here is to get the keto dough nice and thin. This way you’ll end up with tender dumplings, as opposed to doughy ones. This is easiest done using a tortilla press (cast iron ones are the best). But a rolling pin (with some patience) will work too. The dough should end up translucent when held up against natural light. We found 1-inch (11g in weight) balls, rolled out to 4 3/4 inches (12 cm) in diameter worked best. Heap roughly a tablespoon of filling onto the dough. Be VERY careful to not get any filling or juices on the edges or dough won’t stick. Fold in half and quickly close both sides towards the center, the pleats will naturally form. You can trim the tops with kitchen shears if finicky about presentation. Place on a baking tray and freeze right away to avoid the dough getting soggy. Keep adding them to the baking tray in the freezer as you make them. It took us roughly 4 tries to get them shaped nicely, so don’t despair. Missing dumplings, pot stickers and what-not?! 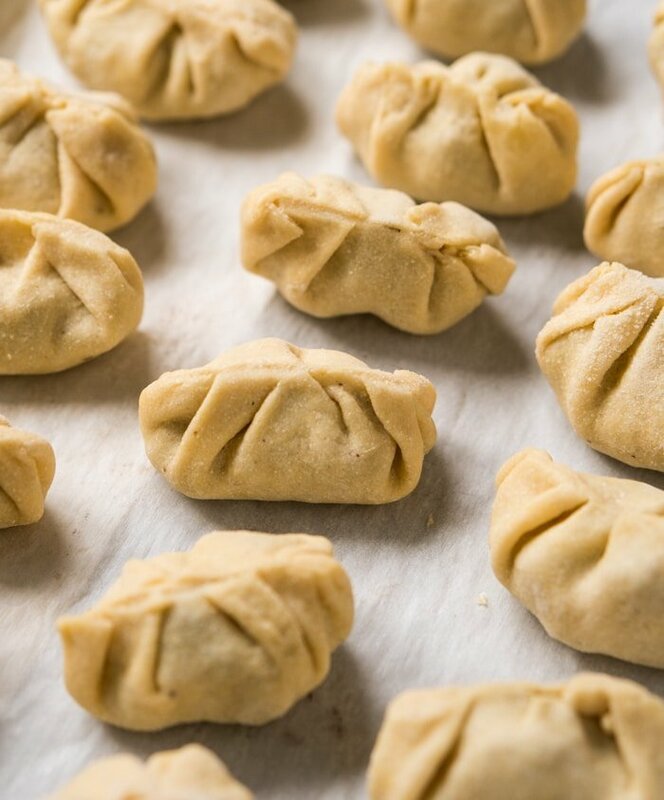 Count on these super tender gluten free and keto dumplings to satisfy the cravings. Place ginger in a small bowl and cover with water. Set aside to soak while you blanch the cabbage. Blanch Nappa cabbage leaves in hot water over medium heat until soft, about 5 minutes. Transfer to a strainer and set aside until cool enough to handle. Wring out the leaves to squeeze out the liquid very well. Transfer to a cutting board and finely mince. Set aside to cool completely. Place ground pork (or meat of choice) in a heatproof bowl that fits comfortably in your steamer. Add minced cabbage and mix well. Strain ginger juices into pork mixture, pressing down with a spoon to get all the goodies out. Add in scallions, garlic, coconut aminos, sesame oil, rice vinegar and white pepper. Mix well until thoroughly combined, cover and refrigerate for at least 30 minutes or overnight. Pour in apple cider vinegar with the food processor running. Once it has distributed evenly, pour in the eggs. Add water teaspoon by teaspoon, as needed, until the dough forms into a ball. The dough should be firm, yet sticky to touch and with no creases (which mean the dough is dry and you need to add a little more water). Set up your steamer, heating up the water over high heat until boiling. Place heatproof bowl with pork in the steamer (you want to catch all the juices), cover, lower heat to low and simmer for 12-14 minutes until fully cooked. Don't open the steamer until the 12 minute mark. You can alternatively fry the filling in a pan, but we found best results are achieved by steaming. Remove bowl with pork from steamer and set aside to cool completely, mixing every so often to make sure the juices are soaked back up almost entirely. Roll out 1-inch dough balls (11g in weight) between parchment paper using a rolling pin or a tortilla press (much easier and faster) until 4 3/4-inches (12 cm) in diameter. Heap roughly a tablespoon of filling onto the dough discarding the juices left (see pictures in post). Be VERY careful to not get any filling or juices on the edges or dough won't stick. Fold in half and quickly close both sides towards the center, the pleats will naturally form. Trim tops with kitchen shears if finicky about presentation. Place on a baking tray and freeze right away to avoid the dough getting soggy. Keep adding them to the baking tray in the freezer as you make them. It took us roughly 4 tries to get them shaped nicely, so don't despair. 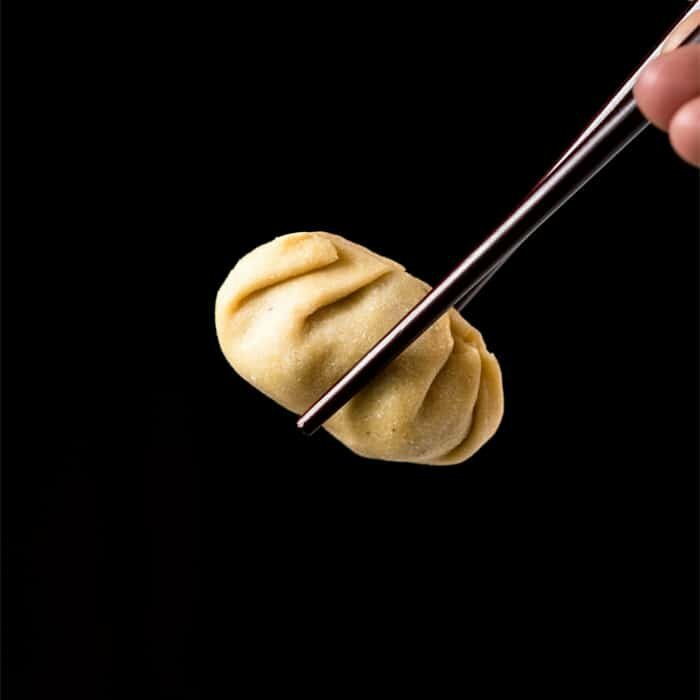 The dumplings can be frozen for up to two months at this point, allowing them to thaw for 15 minutes before cooking. Heat up frying oil of choice (we used coconut) in a skillet or pan over low heat. You'll want it roughly 1-inch deep and not too hot so the dumplings cook slowly. 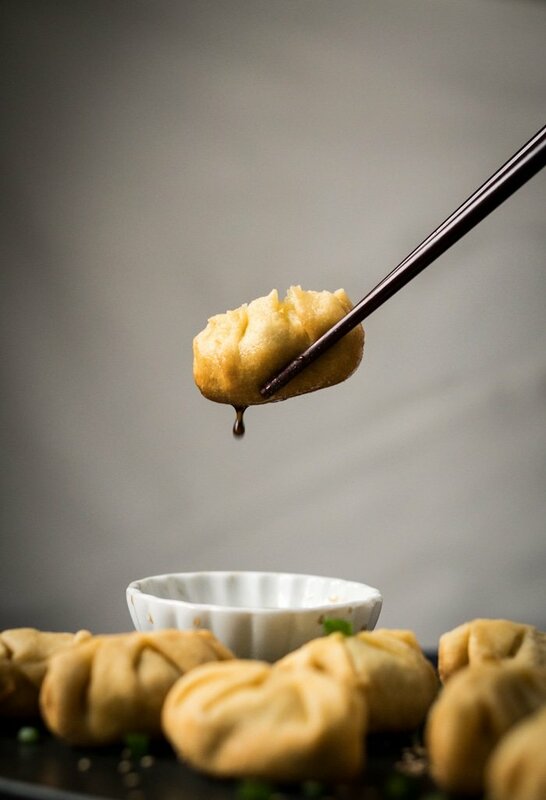 Add dumplings to pan and baste the tops right away and constantly to seal them shut. We prefer to cook them until the bottoms just begin to brown to keep them super tender, but you can fry yours longer to taste. Serve right away with scallions and dipping sauce. 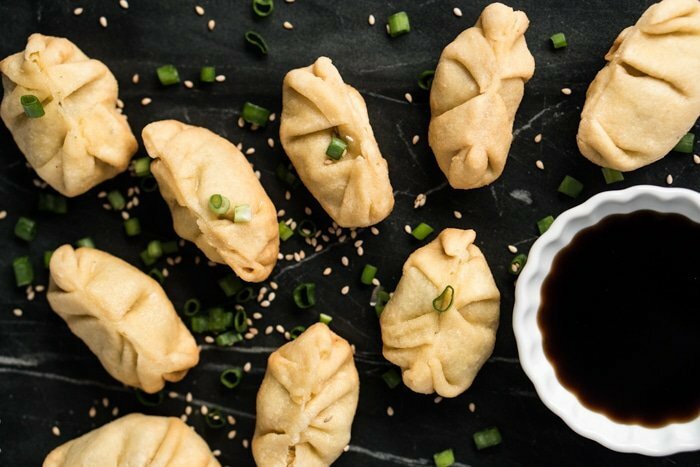 We found this recipe to yield 38 dumplings. Nutrition facts below were estimated per dumpling with the filling. Can you sub guar gum for xathan gum? Can you use regular aminos instead of coconut aminos. The regular aminos have fewer carbs. Can you cook these in an air fryer and for how long? Can I use an instant pot as a steamer? Thank you! Hi Debby! You can sub with another vinegar (such as white wine) xo! Just a quick question, this might be obvious but I’m not sure. When making the filling, do you put everything together and steam it that way, or steam the meat and then mix it with the rest? In addition, are you pouring the water from the ginger into the meat, or just literally strain the juices out of the ginger after its been soaking? Thanks, and I can’t wait to try these- I love the tortilla recipe, so this should be awesome. how would you steam it if you dont have a steamer? and a food processors. can i still use my hands ? Just get a large pot with a lid. Fill a bit of water in the bottom, then put the fillings bowl in the middle, and put the lid on. if i make this instead of steaming it can i fry it? and or how would you steam it if you dont have a steamer? and a food processors. can i still use my hands ? Are you suppose to to make the dough and let it sit in the fridge for 5 days before you can use it? It says: Allow dough to rest for 15 minutes at room temperature and place in the fridge FOR 45 MINUTES (and up to five days). Please disregard last question. Found steaming duration beneath instructions section! How long do you steam the meat? How much water do you put with the ginger? Can these be deep fried? Would the dough hold up? If it’s sealed well, I don’t see why not Lola! Is there any chance these could be put together with raw filling and then boiled? Thank you. These look delicious! I just made some up but haven’t cooked them yet. I messed up though, followed the recipe perfect, except missed where it said don’t substitute flours in this, my bad! I used more coconut flour as I was running low on almond flour. Bad mistake, the dough wouldn’t stay together or roll out. It worked in the food processor, made a nice ball and was still sticky. But after sitting and refrigerating it would not roll out, stuck to the parchment paper and when I tried to close them they fell apart. As a result of the coconut flour I’m sure. Will know better next time! I made them the best I could and they don’t look pretty but should taste great still I think. I am freezing for a bit to firm them up really good before I try and cook them or they won’t make it in one piece! Can’t wait to try them and next time will know. Your recipes are great! What a treat to be able to make things my family loves as well that I can eat and not worry about. 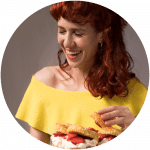 I am type 2 diabetic so the very low carb is great for me and your recipes are also great for low or no sugars too. Thanks so much for all the time and effort you have put into these recipes and for sharing them with everyone. Hugs and Love to you!! Kelly that’s so wonderful to hear! 🙂 And fingers crossed the dumplings turned out tasty at least!! Coconut flour behaves SO differently that it’s a bit hard to sub xo! Can I make the dough ahead of time then fill and pan fry? One more question…..if I make the dough, and do not fill it. Can I refrigerate and/or freeze it to give to share with someone? I don’t want to fill it, because I’m not sure what the person would like to put in it. I would just keep it in the fridge rather than freeze it. You can freeze it shaped already though (the texture changes a bit). Hi! 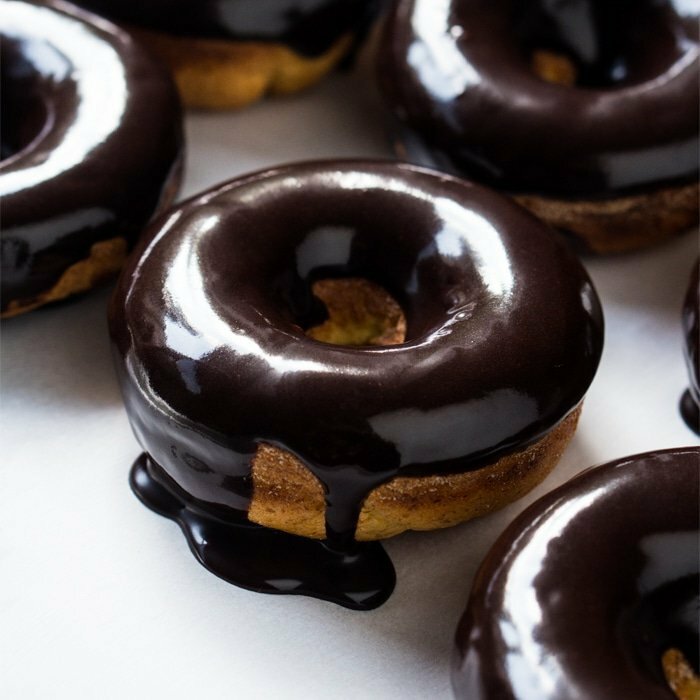 Making these today, wondering if I can use a stand mixer instead of food processor? Hi Loralie! Yes you can definitely use your stand mixer (I would suggest the paddle attachment). xo! I wonder how well this dough would work for egg rolls. Have you tried it for that yet? Hi David! It works, but not perfectly as it doesn’t crisp up. BUT, it still tastes great. So compromise? xo! Hi! I stumbled upon this recipe via Pinterest, and it looks delicious! How would I make these without a steamer? Hi Chelsea! You can just go ahead and cook the meat in a skillet or pan. You get more of the traditional mouthfeel though if the meat is steamed. xo and hope you enjoy! I’m looking forward to making these!! I recently made the raviolis! Soo wonderful. I used some of the ravioli dough for a thin crust pizza. I just rolled it out til about 1/4 in thick. Kind of made an edge. Baked for a bit. Topped it with a bit of an Alfredo sauce, a little mozzarella, fresh mushroom, fresh spinach, heirloom tomatoes tossed with a bit of fresh basil and olive oil. Baked it til bubbly. Drizzled with just a bit of a balsamic reduction. The dough was so very good. Held up perfectly. Hi Amber! That’s awesome so happy you enjoyed the ravioli so much! And your pizza sounds delicious too! ps. 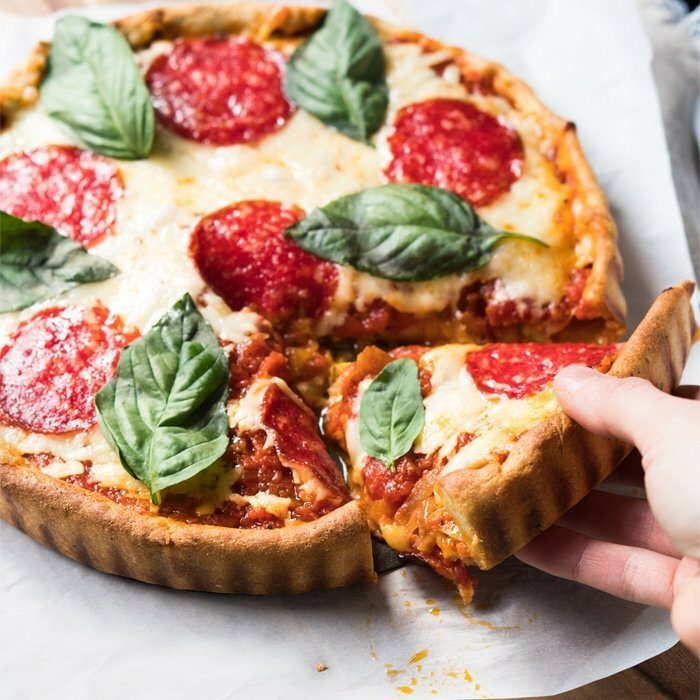 check out the deep-dish pizza, the dough for that one is pretty much the same but with some added baking powder etc to make it more dough-like. xo! I have to make these. Do you think I could use my crepe maker to make the keto dumplings dough? Many thanks. Love your site! Hi LaWanda! So happy you’re enjoying the recipes! In terms of the crepe maker, I’m not sure how you would need it here? The dough is not pourable, you need to roll it out. Are we talking about the same appliance? xo!